There's several ways to print receipts showing costs and tracking number, if you want a hard printed copy. 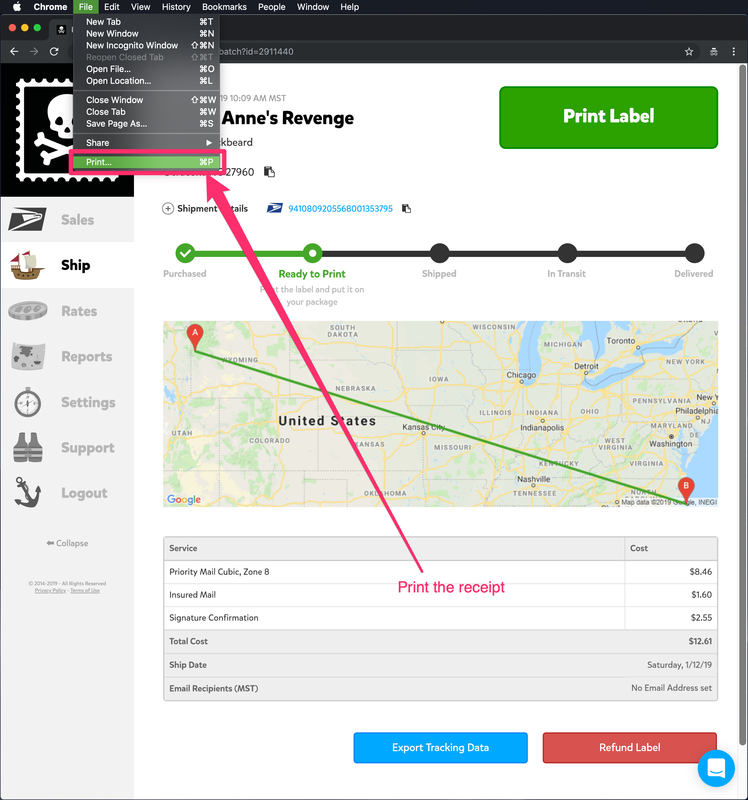 When you buy a label in Pirate Ship, there's several ways you can print a receipt showing your costs. When you're buying a label, if you don't have enough credit in your account balance to make the purchase, your payment method is charged. The credit from this payment is put into your account balance. To create a label, the credit is then withdrawn from your account balance. If you have enough credit in your account balance, your payment method will not be charged to purchase a label. This is common when you've set a Minimum Payment Amount to load your account up with credit, or if you've had refunds approved by USPS. Payment receipts just show that you've purchased postage credit from Pirate Ship, and these are available to view and print in Reports > View Receipts. These receipts include details such as the card you used to pay, but do not include details about any shipping labels that might have been purchased with that credit. Shipment receipts breakdown the cost of the postage and any extra services you added, and include the tracking number of the shipping label. You can view these receipts by finding the Shipment on the Ship page and clicking it to view the details. If you have any questions just use the chat icon on the bottom right of the screen, we're here to help!